Jenny Sledge holds a B.A. in Theatre and English from Oberlin College and an M.A. in Theatre History and Criticism with a concentration in Dramaturgy from The Catholic University of America. She is a Dean’s Doctoral Fellow at the University of Kansas. 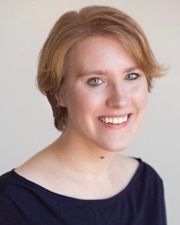 In addition to serving as dramaturg for various productions, she has taken part in the Kennedy Center New Play Dramaturgy Intensive and served as the Literary Intern at Studio Theater in Washington D.C., serving as assistant dramaturg on their 2018 production of Brian Friel’s Translations. Her research centers on modern Irish drama focusing on the narratives of women and the creation of an Irish national identity. Having previously studied at Trinity College, Dublin, where her interests began, she has conducted research at the libraries at Trinity College and Maynooth as well as the National Library of Ireland.